Full and Half Day Private Tours available. CALL TO DISCUSS FURTHER. Perfect premiere experiences for the adventurer that values privacy, flexibility and intimacy. *Our tours are offered to groups of 10 or as a Private Tour. All tours offer complimentary on-board snacks & drinks! Full Day Tour offers authentic Bahamian buffet meal at Ty’s Sunset Bar & Grill for additional $25 per person. 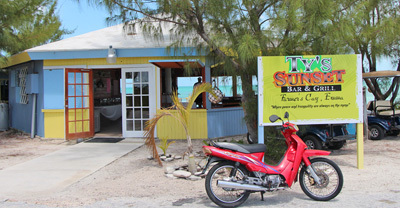 Ty’s Sunset is a unique restaurant situated on Little Farmer’s Cay near an enclosed airport strip and 900ft White Sandy Beach! Call or email us today to book your tour!